The final segment of Martin Bashir‘s eponymous MSNBC show is titled “Clear The Air,” and in it the newish MSNBC anchor offers his own special commentary on a variety of topics, usually culled from the day’s news. In today’s segment, he compared the lives and contributions of two disparate, and contrasting, public figures, both of whom were in the news yesterday, though for very different reasons. Sarah Palin announced that she would not be running for President came along with the sad news of Steve Jobs death. 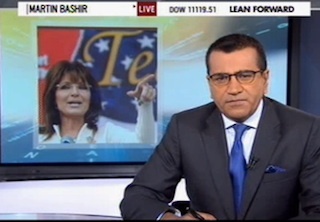 Oddly, Bashir saw the death of the Apple founder as a means to score political points against Palin. Too soon? It will always be too soon for this sort of comparison. Regardless of what you might think of Sarah Palin or Steve Jobs, the comparison of why, and how, they were in the news yesterday is an odd angle at best. To use the career and impact of Jobs — of which Bashir is understandably a huge fan — as a means to slam Palin feels both inappropriate, and counter to the intelligent world that Jobs aimed to create. 4PM host Dylan Rattigan found the comment to be quite moving, and said as much to Bashir during the toss to his show.